The “invasive” status of some widely produced plants has become a serious marketing barrier to nurseries nationwide. 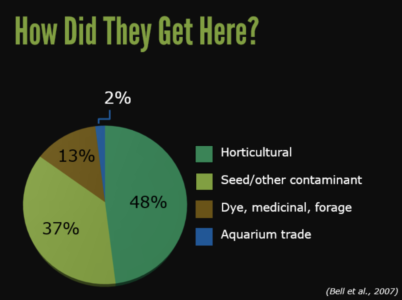 At the same time, the horticultural industry has a key role to play in preventing new invasive plants from taking root, as the nursery trade represents a significant vector. Throughout North America, 82% of the 235 invasive woody plants are horticultural in origin (Reichard & Hamilton, Conservation Biology, 1997). A few examples , known to be invasive in multiple states nationwide, include: Japanese barberry (Berberis thungbergii), Scotch broom (Cytisus scoparius), and Chinese privet (Ligustrum sinense). For the entire country, including both herbaceous and woody species, estimates of the invasive flora derived from the nursery industry vary widely from 34 to 83% (Bell et al., Hortscience, 2003). Historically, the horticulture industry has been accused of inaction when it comes to promoting invasive plants. What more can the trade do, to be part of the solution, without the burden of yet another regulatory constraint? A new online plant risk evaluator (PRE) platform aims to address this question, while equipping the nursery and landscape trade with a new, collaborative decision support tool. A tool that will positively impact the industry’s ability to: stay one step ahead of regulatory threats; bring more scientific basis to regional plant lists; and, promote better (and exclusively non-invasive) plants in regional markets. 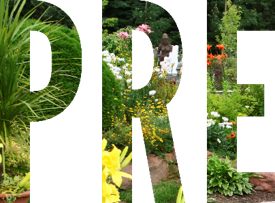 In fact, the research behind the PRE™ model was jump-started by a $20,000 grant from the Horticultural Research Institute, in 2011. This article is an introduction to PRE, the science behind it, and what PRE communities around the country have learned during the first year of deployment (thanks to the generous support of a 2017 USDA Farm Bill grant). PRE is a 20-question, voluntary Weed Risk Assessment (WRA) tool designed specifically for screening non-native, terrestrial, ornamental plants. A WRA is a systematic, question-based process that estimates the risk of a plant species becoming invasive in a particular region. PRE is one of the first WRAs developed with the horticultural trade in mind, to screen plants already within our national borders, as well as newcomers (introduced via plant collection trips or cultivated varieties). PRE user groups include but are not limited to: plant scientists, nursery and landscape trade associations, growers and distributors of ornamental plants, and plant hunters. It’s easy to be romanced by a deceptively beautiful and invasive plant, if we don’t know better. With plant breeders focused on traits that customers are demanding – easy to propagate, having long bloom cycles, growing rapidly, tolerant of different weather and soils, and resistant to pests, it’s more challenging than ever to distinguish the desirable from the damaging traits. 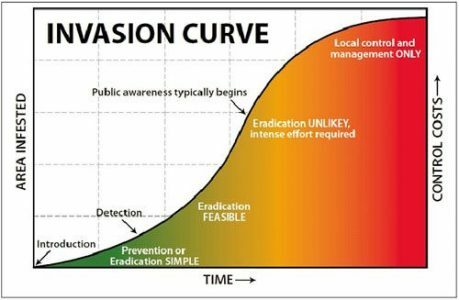 Invasive traits are aligned near perfectly – easy to establish, growing rapidly, being fecund and adaptable, and having no natural competition. Luckily, only a very small percentage of the thousands of new plants introduced each year will ever pose a high invasive risk in any given region. The key is to identify that small handful of high risk plants which, if left unchecked, could become the next landscape transformer. It is equally important to recognize when a historically well-behaved and popular plant starts changing behavior and naturalizing in a variety of wild land areas…Enter PRE. 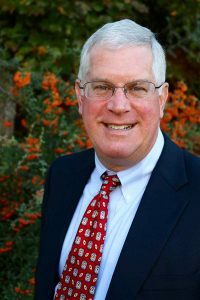 In 2011, the Horticultural Research Institute (HRI) funded a research project led by Sustainable Conservation (a California-based 501 c3) to develop a new WRA model – one designed specifically with the horticultural sector in mind. To meet the needs of the trade, the WRA would have to demonstrate high accuracy in predicting both invasive and non-invasive risk in a given region. It would also need to be practical — balancing ease-of-use without compromising scientific credibility. Of no less importance, the new WRA would be voluntary. “The green industry is made up of a group of highly conscientious plant producers who are keen to lead environmental stewardship efforts. 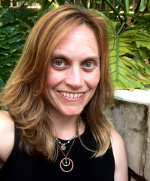 The PlantRight PRE tool enables our stakeholders to remain proactive on this front through production of plant materials they can more confidently recommend as noninvasive,” says, Dr Jill Calabro, HRI’s Science and Research Director. 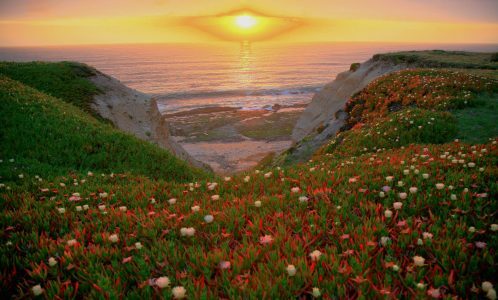 With the support of HRI and Sustainable Conservation, a group of plants scientists at the University of Washington and the University of California at Davis, set out to develop a better WRA for the trade. This new WRA would equip the trade with knowledge to promote exclusively non-invasive plants in regional markets, while preventing new invasive threats from taking root. The plant science team’s first phase of research was identifying the most important questions in determining invasive (and non-invasive) risk – eventually paring 56 WRA questions down to 19 (in 2015, a new question was added to PRE, by Professor Joe DiTomaso and Christiana Conser, bringing the total number of questions to 20). To view the Conser et al. data table showing the original 56 questions including: statistical comparisons between invasive and non-invasive for each question, the percentage of times each question was answered, and whether the questions were eliminated or added to the final model, click here. To view the table showing the Conser et al PRE model questions with statistical predictability, in separating known invasive and non-invasive species, click here. The PRE model demonstrated a 95% average accuracy rating in predicting both invasive and non-invasive regional risk. At the same time, PRE possessed fewer than half the questions than the (Australian) WRA – the gold standard in border screening WRA tools. The result was much faster screening times – a matter of hours, versus tens of hours. The first year focused on developing technical capabilities, user group permission infrastructure, and the critical, myriad How To instructions. Sustainable Conservation also assembled a national PRE Advisory Group of diverse horticultural stakeholders, to provide guidance on PRE development and deployment beyond just California. Early in 2017, with generous support from a Farm Bill (APHIS 10007) grant, Sustainable Conservation and plant scientists at botanical gardens in Texas, Illinois, Georgia and Minnesota, set to work deploying PRE on a national scale. In addition to identifying critical usability enhancements, this collaboration provides an early glimpse into how the nursery trade might do more to address invasive plant challenges, without the added burden of yet another regulatory constraint. 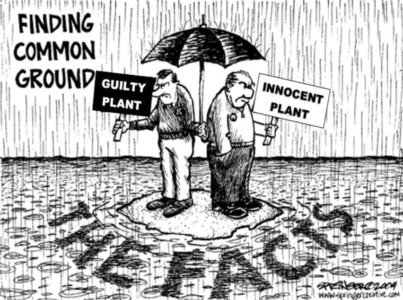 There’s no doubt companies already invest significant time and resources into plant trials, to identify that (hopefully) award-winning or occasionally weedy behavior. Unfortunately, even the best trialing practices cannot always determine a plant’s behavior over time, location and other environmental influences. Especially considering that many of today’s most well-known invasive ornamental plants underwent a decades-long lag phase before becoming the costly landscape transformers they are today. Having a tool like PRE allows the trade to share and monitor plant behavior, provided evaluations are conducted on a somewhat regular basis. In some cases, PRE may be used to defend good plants from bad raps; or, other times PRE may help identify an emerging invasive risk or a plant that requires more evaluation (e.g. trials, etc.). In all circumstances, PRE can be used in ways that are good for business and the environment. Which brings us back to the Farm Bill project. The project involved evaluating 50 economically-important landscape plants in each state, for a total of 200 evaluations, with special focus on the more contentious yet popular plants (“contentious” refers to plants that are known or perceived to be problematic). The project also involved recruiting regional plant experts to participate as volunteer reviewers of these evaluations. It is important to view PRE as more than just a rating. The evaluation and review phases of the PRE process enable the regional PRE communities to base decisions on science and make decisions by consensus. This is especially important for plants, with higher risk ratings that are new to the marketplace, or those plants that are (for whatever reasons) exhibiting different behavior patterns than in the past. There are instances where the PRE rating is considered too high, or not high enough by reviewers. For example, a high risk rating may be prioritized as lower concern by the review group, based on any number of factors (e.g. on-the-ground evidence, a plant’s economic importance, size of potential invasive range, much higher invasive priorities, etc…). While this feedback from regional reviewers did not change the rating (because none of the 20 PRE answers were changed), this type of feedback is important to inform the Evaluation Summary statement. PRE screener and Atlanta Botanical Garden’s Kylie Bucalo describes at length the dearth of data available on this sub-species. She notes in her evaluation summary that, “This evaluation was conducted mostly using parent species (Agapanthus praecox) information as the cultivar does not differ very much (not sterile nor has severely reduced reproduction) … It seems if any Agapanthus praecox is to be considered it should be plants from the subspecies minimus, and Agapanthus praecox ssp. minimus ‘Peter Pan’ is surely an attractive suitable ornamental choice.” This is one example that underscores the importance of basing decisions on science (with PRE), and making decision by consensus of regional experts. At the same time, a low risk rating may be prioritized as higher concern by the review group based on any number of factors (e.g. on-the-ground evidence, low screener confidence rating, lack of data/evidence that plant behaves differently than its invasive parentage, etc…). The PRE review process captures credible and highly relevant data that may not always be identified by the PRE screener during the literature review process. Reviewers, all volunteer, represent the nursery trade, conservation communities, and plant science. 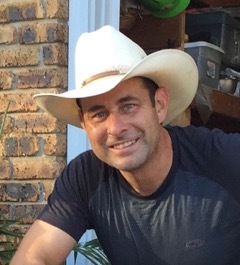 Plant experts with a healthy dose of skepticism are also among those to review PREs, including Cedar Creek Tree Farms’ Trey Wyatt in Texas, “I am glad to help with this project, but let’s be clear on what we are doing. We are judging plants from a human perspective of their worth in a particular environment not nature’s, as she already gave her opinion by making them successful,” says Wyatt. Through 4 brief interviews, garden collaborators in Georgia, Illinois, Texas and Minnesota share highlights of their Farm Bill project, and what they feel is most important to know about the PRE platform. Click on the images below to access these interviews. 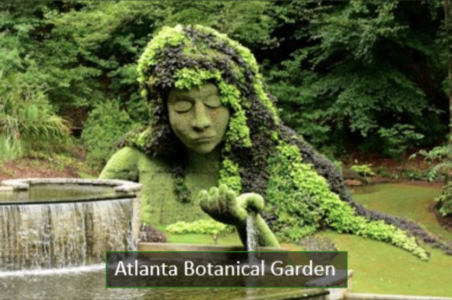 Click above to read an interview with Atlanta Botanical Garden‘s screener, Kylie Bucalo. 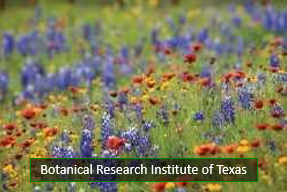 Click above to read an interview with Botanical Research Institute of Texas‘ screener, Kim Taylor. 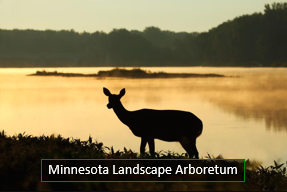 Click above to read an interview with University of Minnesota Landscape Arboretum‘s screener, Mike Monterusso. 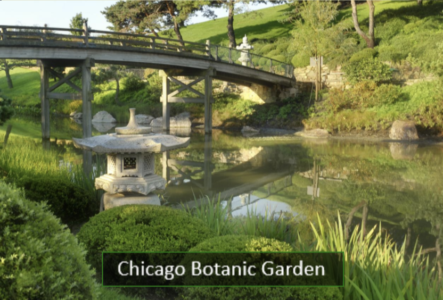 Click above to read an interview with Chicago Botanic Garden‘s screener, Emily Russell. If you’re interested in viewing PDFs of the 200 PRE evaluations conducted for the 2017 Farm Bill project, please click here. Over the past several years, industry and government have focused efforts to address the issue of invasive plants via voluntary self-regulation, rather than adding more regulatory constraints. Unfortunately, without a commonly accepted, science-based platform to address this issue on a regional, state-by-state, national, and multi-stakeholder basis, progress will be slow if at all. PRE offers this platform, and a practical solution that is voluntary — relieving the industry of potential regulatory pressure and economic disruption. 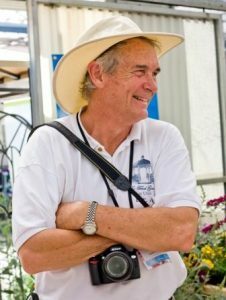 In the coming year, Sustainable Conservation and PRE collaborators hope to expand PRE screening capacity at botanic gardens around the nation, grow the database, and engage all major nursery and trade associations in utilizing PRE as a resource to promote even better plants while staying one step ahead of invasive plant, and regulatory, threats.